Tiffany McCarthy, administrative assistant at the Accident Injury Management Clinic/St. Catharines Chiropractic & Health Centre. 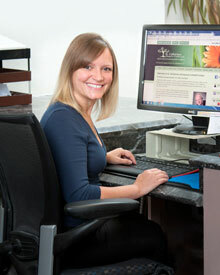 Tiffany joined our team in August 2012. Tiffany is a lifelong resident of the Niagara Region. Growing up in Welland, Tiffany is a graduate of Niagara College Canada with a Business Administration – Information Technology Diploma. Since entering the workforce Tiffany has held positions in finance, sales and information technology. Tiffany brings a vast knowledge of cross functional teams and task management to the clinic. Tiffany enjoys spending time living an active lifestyle with her husband and three children. Whether at the hockey rink, soccer field, swimming pool or dance studio, Tiffany remains involved in community sports and recreation.